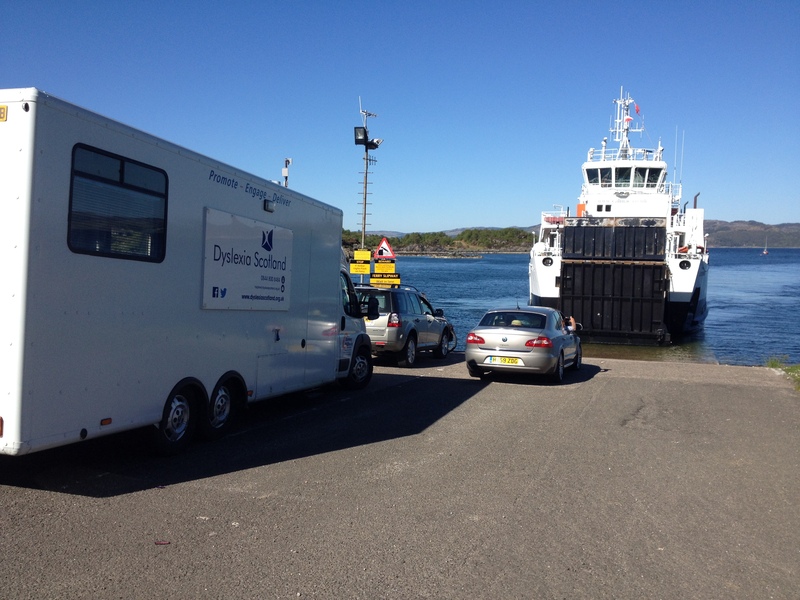 Our tours across Scotland in the Dyslexia Van have resulted in quite a few funny moments, sat nav frustrations and of course a huge variety of visitors to the van. So many people came to chat to us when they saw the van because they had a ‘connection’ to dyslexia, or were just curious. Often it’s been tourists – we’ve had (dyslexic!) fishermen from England, a retired teacher from Norway and an American couple who took information for their niece who lives in Glasgow as they thought she might be dyslexic. One woman on a stop-off from her cruise ship to Stornoway even abandoned her hour long visit of the town in favour of listening to one of our talks! It’s at times like this, or when someone makes what they think is a witty quip, that I sometimes wonder why people think it’s appropriate, or if they really think about the possible impact of their comments. I’m not dyslexic myself and none of the people with dyslexia that I’ve ever met is po-faced or lacks a sense of humour about dyslexia. But I also know that dyslexia can be a struggle and hold people back if they don’t get the right support and that the reality can be far from a joke. Our next magazine is all about Dyslexia and Adults and we’d love to hear your thoughts about things that people say about dyslexia and how they affect you. Is it easy enough to join in on the jokes or does it hurt at times? Or have there been things that someone said to you that have had a lasting impact, either good or bad? Please email sharon@dyslexiascotland.org.uk with your thoughts. My son can’t write his name. He has no interest in learning which letter comes after which in the alphabet. He struggles with simple instructions and unless he is looking directly at you when you speak he has absolutely no idea what you have said. His long-term memory is astounding recalling details, names and places which have long since left my mind, although he can’t recall me asking him to get a pair of socks five minutes ago! He talks all the time; he asks questions from the moment he rises in the morning until his eyes (finally) close at night. He has a passion for knowledge and devours documentaries and encyclopaedias on the natural world; insects, plants, sharks, bird-eating spiders in the deepest darkest jungle or colour-changing lizards native to the Sahara. He completed the library summer reading challenge in three days. He taught himself to ride a scooter before he was two and learned to ride a two-wheeler bike with confidence in less than two hours, aged four. This summer my son starts school. His father is dyslexic and early indications are that he is too. I know that things have moved on dramatically since his father’s horrendous school experiences which consisted, in no particular order, of late diagnosis, ridicule, missed learning, labelling, name-calling and a whole host of damage to what should have been the best years of his life. The school we have chosen appears to be switched on, engaged, passionate and child-centred. They have a positive approach to dyslexia and a good track record of supporting pupils. So there’s nothing to worry about – right? I just worry about him. I just do. I am not sure how he will deal with having to do things differently from his peers. I worry about how to support him, when to push and when to take a step back. I worry about how me and my husband will work together to give him a consistent approach to homework when our experiences and starting points are so different. Having lived in a family affected by dyslexia I understand that it is complicated – for every challenge it presents it also seems to open up new possibilities. But I also know for every Richard Branson who believes that his dyslexia enabled him to build his empire and see opportunities others could not, there is a young adult male in prison whose life has gone off the rails because he was unable to get the support he needed. How do I build his resilience and confidence so that he can overcome the inevitable challenges ahead? How do I ensure that the happy, confident young boy entering primary school grows into the happy, confident young man entering the world of work and beyond? I don’t have the answers yet. We are just at the start of the journey. We will go on this adventure together as a family and will be there as a safety net with open arms whenever he needs us. I know there will be tough times but I am also confident that he will continue to surprise us as he has done almost daily for the past five years. I am optimistic about his future, I think he is going to have a wonderful life, but we know that we have much to learn and this is only the beginning.